But there are times, or situations when the customer is not right and you have to say ‘NO’ to them. For example the customer is asking for a specific product and it’s out of stock that time, or maybe he is demanding something unreasonable. So how to say ‘NO’ to customers? Though the customers always love to hear ‘YES’ but when you have to say no, there are some smart ways to follow if you want to preserve your healthy relationship with them and your company reputation. By explaining your limitations and focusing on what best you can do, your customer may accept your apologies without getting angry or upset. 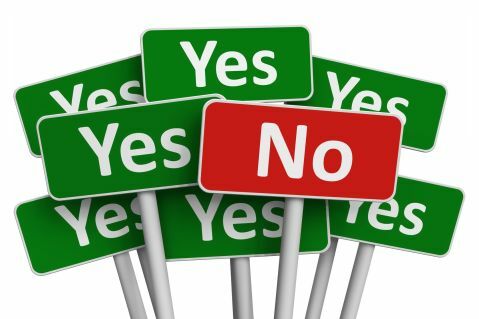 Here are the best 7 ways to keep in mind for those situations when you will not be able to deliver your customers what they actually want and have to say ‘NO’. It’s one of the best ways to rarely say no to your customers. Make sure that they know about your capabilities, also your team needs to know the limitations of your products and services. So they will not make any promise to the customers, which can’t be fulfilled and the customers also will not have false expectations. A simple, ‘No, we can’t help you’ are not the words you should say to your customer. You have to be very polite and maintain a positive tone while explaining your limitations. If it is appropriate, then there is obviously a hope that the customer will return to you in the future. Obviously the customer is not happy hearing that you can’t provide what he is asking for. But make sure you carefully listen to him and reply in a professional and polite way. You may not able to provide what your customer is looking for but make him understand that you still care. It’s true that you have some limitations because of which you can’t help that customer, but you can obviously offer some other way outs. If you and your customer are both stuck in a situation, start asking more questions to suggest other options. Let your customers know about your company, its offerings and limitations. Then only they will understand why you are not able to help them. If they understand your limitations, they will never feel bad or insulted, may come back to you for business. Asking feedback from a customer who is already not happy might seem a bit idiotic, but trust me, it’s one of the best ways to improve the product offerings as well as the quality of your customer support. If you simply ask them, “What improvements you need from our services”, you will definitely get some valid and useful feedback. On the other hand, your customer also will understand that you really care about them and about further improvements. Saying no does not mean that you are going to lose that customer. There are ways to make him feel that he is still important for you, though you could not help him for a specific reason. That’s the most important thing for an individual- to feel valuable regardless of what you could or could not do for him. I am just starting my business and I find saying ‘no’ to clients that are not ideal quite difficult – however, it must be done. Mostly, the fear is around not having the income,.Thank you for this article. definitely it gonna to help me. Thanks Adriane. Obviously saying ‘NO’ to a customer will be the last option. First try to find other way outs, and if nothing works, then only explain him/her why it’s not possible. I agree with what you posted in this article. I know that this will help a lot of people to support customer. Points here, are very much logical. I appreciate you sharing this with us all.